while other cities that have more population AND are fully upgraded with 3 million populations 100% morale cities only produce 2,600 ? I captured a total of 500 provinces and barely make enough resources to defend the massive region against all players!? I dont understand, i keep investing resources into economy but in return dont receive much. I captured this large mass of land, including spain and Italy, and yet, most cities with fully upgraded and repaired industry only produce around 3000 resources. I'm a tad bit confused. The post was edited 5 times, last by Bionoman ( Sep 18th 2016, 8:18pm ). 12000 for core province with double production, 100% morale, full IC and infrastructure is pretty standard ammount of production. For the province that producese 2600... it is probably non core. Dont you think these noncore provinces produce a bit too little ? The resource production is barely enough to do anything ... as in, i cant get all the factories to produce much as everything is expensive, including repairing damaged provinces and even upgrading. 3000 steel to build a new infrastructure upgrade in itself is tad bit expensive ... so expensive that you cant even upgrade the whole continent. Its a conundrum because, on one side, the game forces you to expand to get more recources, and on the other, once you're too big, everyone wants to attack you and you cant defend yourself properly unless, you use gold. I am not a gold user, i was one. But this low production of resources really does not allow you sustain much at all. Non core provinces produce at 25% production rate compared to core provinces. That is because otherwise people who conquer a lot at the beginning would be unstoppable very soon. However, I don't think non core production is low, you just have to keep morale high, preferably by conquering enemy capitals often (the best way is farming AI) or by other means. unfortunately you have chosen the political coloring. 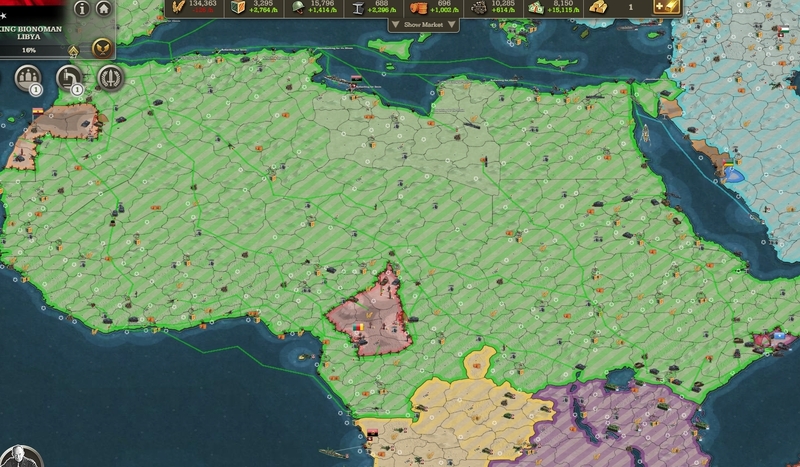 Please post one screenshot with the morale coloring to get a look on the morale circumstances of your 500 provinces. You might need to explain the concept of "farming" the AI to him...it's a tactic that works pretty nicely in Africa, but hard to grasp. As for the production rates being so low, build less troops ... slow down construction enough to build up resources faster. Remember that you don't want to conquer a ton of land unless it's already fairly developed. Also, remember that those same problems that you may have with non-core provinces are the same provinces that your competitors are having. So, all being equal, you should be able to do alright.